Increase Your Home Or Business Security With High Security Locks! High security locks are a cut above standard security, with the ability to withstand greater tampering forces. Typically, this refers to someone attempting to breach the lock with prying or impact forces, and standard locks aren’t designed to withstand such punishment for long. In short, there is a difference between a lock that is merely built to close a door, and one that is built to keep it closed. That difference isn’t subjective, either, as high security locks are rated as such, and have been tested as proof. Forced entry resistance – This is the hallmark of a high security lock, and where lock brands like Medeco are truly impressive. The American National Standards Institute (ANSI) is responsible for grading locks, using a criteria that is largely based on forced entry resistance. A grade 3 lock, for example, can only withstand two strikes, using 75 pounds of force, before failing. A grade 3 lock is not ideal for high security. A grade 1 lock, which is typical of Medeco lock products, is capable of withstanding 10 strikes, using 75 pounds of force, before failing. It takes a lot longer for a burglar to kick 10 times than it does for them to kick twice, giving building occupants much more time to react to a dangerous situation. Restrictive keyways – Don’t overlook the threat of “bumping,” which is when a burglar forces a blank key into the lock, hoping to jam the pins and force the lock open. This is a problem with cheap deadbolts, but high security deadbolts, including Mul-T-Lock and Medeco deadbolts, are designed with tight keyways that prevent someone from forcing in a key that doesn’t fit. 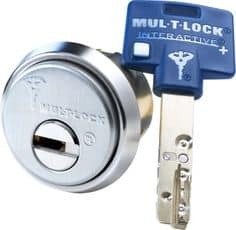 Restrictive keyways also make it harder for burglars to insert manipulation tools into the deadbolt in an attempt to force the pins into place. High security pins – High security deadbolts are usually made with modified pins that resist various forms of manipulation. These modified pins are engineered with serrations or with an unusual shape, like a spool or barbell. When attempts to manipulate the pin are made, they trigger and jam at the shear line, preventing the lock from being turned. 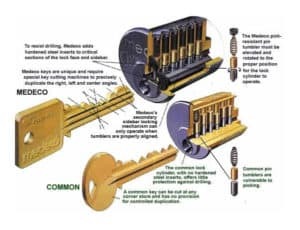 Key control – High security locks are engineered in a way that makes it nearly impossible to make an unauthorized key for them. Some even require special machines for key cutting, or require a security card before the lock can be used to duplicate a key. Finally, durable strike plates are a critical complement to high security deadbolts. 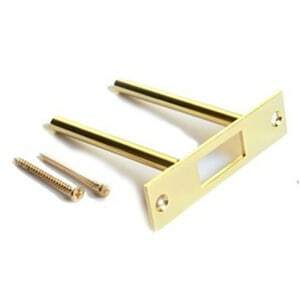 Strike plates manufactured by Tuffstrike are a popular option, as they instantly improve exterior door security. Standard strike plates are anchored into the doorframe, with just a couple small screws keeping it in place. Tuffstrike strike plates are anchored to studs inside the building wall, with much longer and thicker anchoring screws. The result is a strike plate that will not give when a burglar attempts to kick in the door or slam it down. A high security strike plate can hold out for much longer, much like a high security deadbolt, giving people inside time to respond to the situation. For the extra security that quality deadbolts and strike plates offer, they take little effort to install. A reputable locksmith is capable of installing high security hardware in a matter of minutes, making it the easiest security upgrade a property owner can invest in.